Happy New Year Everyone! Yes it’s a little late, but with all that’s been going on in Paris I haven’t had a night to really sit down and write until now. As is common in winter, it has been cold and rainy here, and when it’s like this I crave comfort foods and homemade bistro cooking! 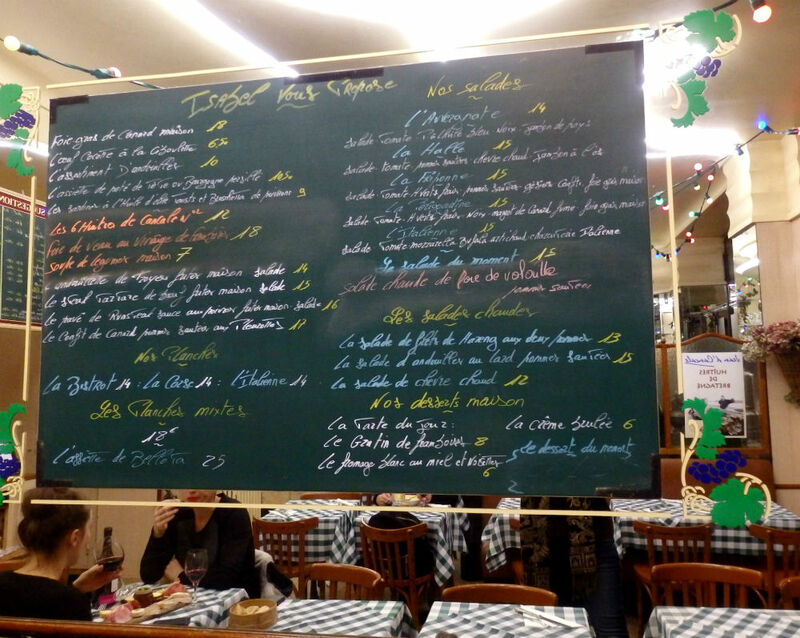 So, for my first post of 2015 here is a review of Le Bistro des Halles, a very authentic French bistro located between Les Halles and Rue de Rivoli where you will find carefully chosen wines, amazing meat and cheese plates and ridiculously good meals! When my boyfriend worked in this area of town he would talk about this place all the time, telling me how great their sandwiches were. They were basic, filled with various meats, but they were so tasty that all of the locals came here for lunch. He equally raved about a dinner he had here one time. So when C, my awesome ex-coworker, said he was coming to town to have dinner with equally awesome V and myself I thought it was the perfect occasion to give it a try! Before I go on, I should fill you in on some basic info about this place. 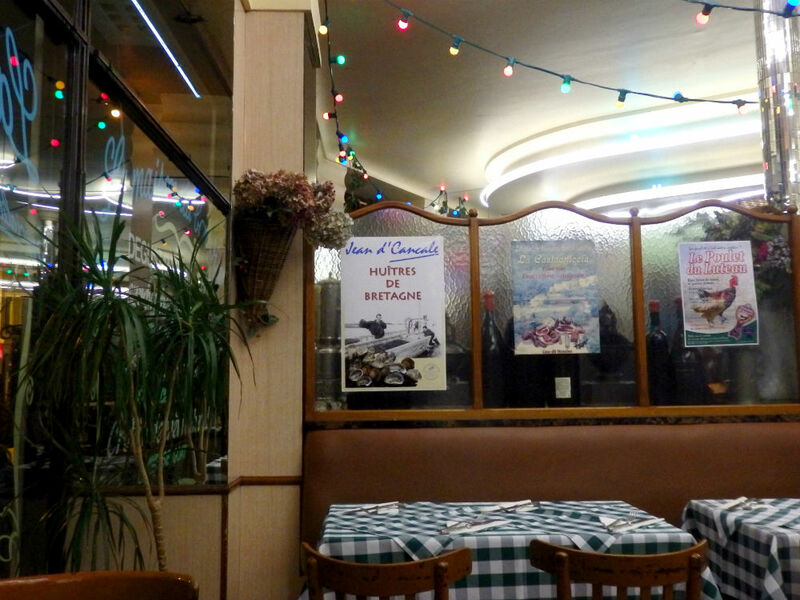 This is an “old-school” French bistro. If you walk in on a weeknight and will probably see a bunch of working class guys (that look like they come here often and are the farthest thing from trendy) milling around the bar and chatting with the staff. The décor is very modest with checkered table cloths, dried flowers and bunches of garlic hanging about as well as chalkboards displaying the menu on the wall. Our waiter was a no-nonsense French guy who takes wine very seriously (quelle surprise!). When C asked for a coke, he shot him a look of disapproval (that reminded me of the time I asked for ketchup with my croque-monsieur in another traditional Parisian bistro and I thought the waiter was literally going to spit on me in disgust)! We all spoke French so I am not sure if the waiters speak English here (I didn’t hear any English around me) or if they would want to make much of an effort with non-French speakers. But I might be mistaken, please give it a try and let me know. Anyways! If I haven’t scared you off already, I will get to the good part. The food! Apparently the lady in the kitchen is called Isabel and she sure knows what she’s doing! 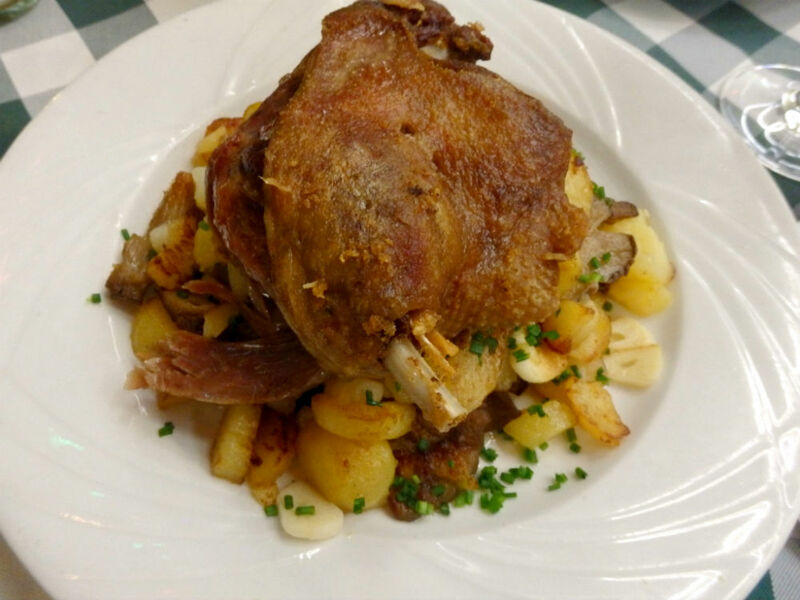 C and I both ordered the confit de canard (or confit duck; 17 euros). You should know that I am a huge fan of this dish, and when I see it on a menu I always have the strongest urge to order it! I have had some really good and some really average/disappointing duck over the past 4 years in Paris, and I have to say that this is one of the best I have ever had! The skin was crispy (as it should be) and the meat was soft, tender and oh so juicy! It came balanced on top of a generous pile of sautéed (I’m guessing in duck fat and garlic) potatoes and pleurotes (oyster mushrooms) and sprinkled with chives. 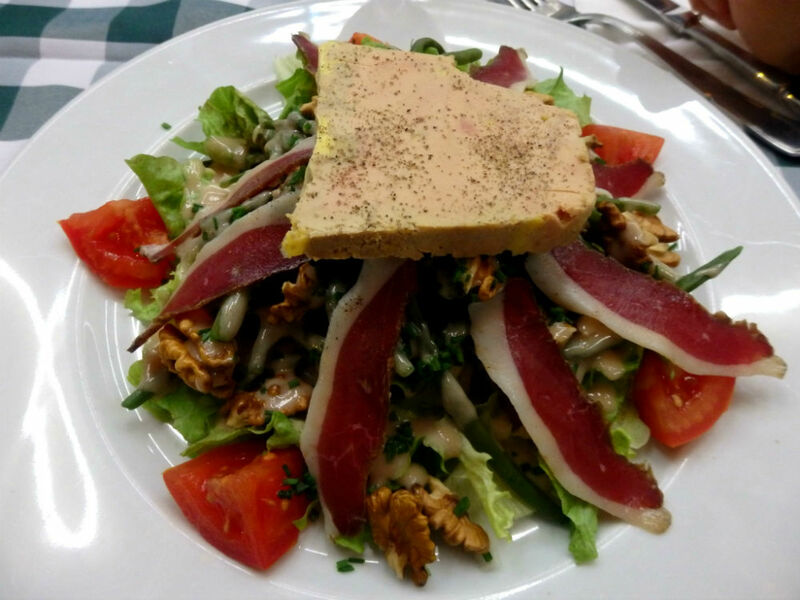 Together with a glass of red wine (I chose the “wine of the day” which was Corbières Abbaye de Fontfroide; 4.40 Euros), my tummy was beyond happy! C also ordered a glass of wine with his meal, redeeming himself in the eyes of our waiter. V ordered a salad named “La Périgourdine” (15 Euros), which from the name you have no idea what it is, but it was definitely not a “diet” salad (none of their salads are), and consisted of lettuce, tomatoes, fresh green beans drizzled in a vinaigrette and topped with smoked magret duck, walnuts and, oh yeah, a nice thick slice of their homemade foie gras! During dinner, V wanted to order another glass of wine before having finished her current glass and the waiter calmly said that he was surveying the room and would come by when he saw that her glass was empty (umm…okay). We found this strange at first but he did keep to his word, after only the briefest delay. We were pretty full by this time but when the waiter asked us if we wanted a dessert, we found it too hard to say no. 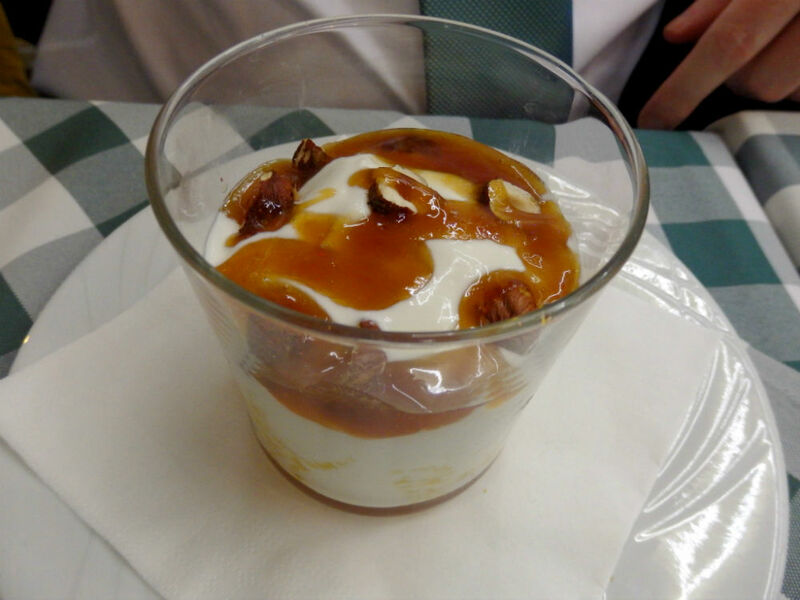 V and I shared the perfect crème brulée (6 Euros) and C had a fromage blanc topped with honey and hazelnuts (also 6 Euros). 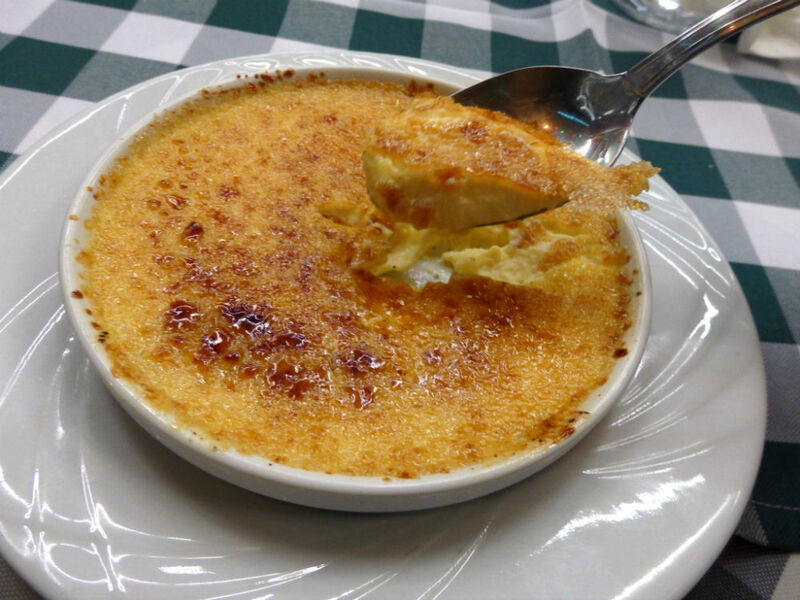 Simple but totally satisfying…just like our entire experience at Le Bistro des Halles that evening. Check it out if you’re in the area and want to eat some good quality food in a laid-back, no-fuss environment. Just take my advice and do not ask for ketchup! 4 serious French waiters out of 5! 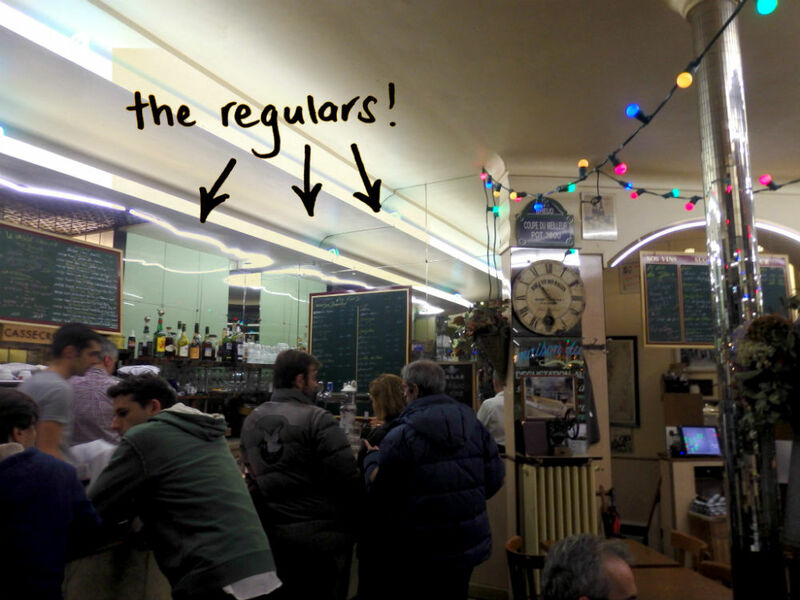 Categories: Uncategorized | Tags: comfort food, French bistro, Les Halles, Paris, Rue de Rivoli | Permalink.